The next hilarious rhyming picture book from award-winning Kes Gray and Roald Dahl Funny Prize winner Jim Field, creators of the bestselling Oi Frog! and Oi Dog! According to Frog . . .Cats sit on gnats, Dogs sit on logs, Raccoons sit on macaroons, Armadillos sit on pillows and Chicks sit on bricks. But wait! Cat doesn't like sitting on gnats, they keep biting his bottom! Will Frog and Dog help him change the rules? Kes Gray was voted by The Independent as one of their top ten children's authors and he is the author of the award-winning Eat Your Peas and winner of the Red House Children's Book Award. Jim Field's first picture book Cats Ahoy! won the Roald Dahl Funny Prize. Oi Dog! was shortlisted for the Sainsbury's Children's Book Award and the British Book Awards in 2016, amongst others. It also won the Teach Primary New Children's Fiction Award and the MadeForMums Award. Much like 'Oi Frog!' and 'Oi Dog!' -this is amazing! All three books are instant classics. Wonderful, bright, hilarious illustrations with witty storylines running through. If you liked Oi Frog! and Oi Dog! then there is absolutely no way you can miss out on Oi Cat! 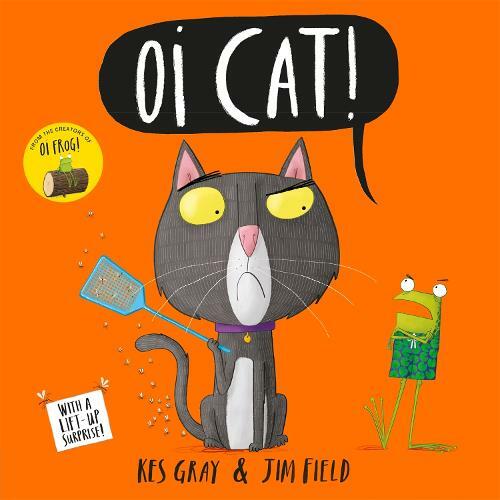 IF you already love Oi Frog and Oi Dog - then you will be over the moon with the brilliant Oi Cat!!! If you haven't read any - go buy them and love them!